Here in Columbus, we’re fast approaching the Columbus ZombieWalk 2011 and we’ve been busy stocking up on our supply of make-up, prostheses, special-effects and costumes. Whether you’re a novice or a pro, we have what you need. 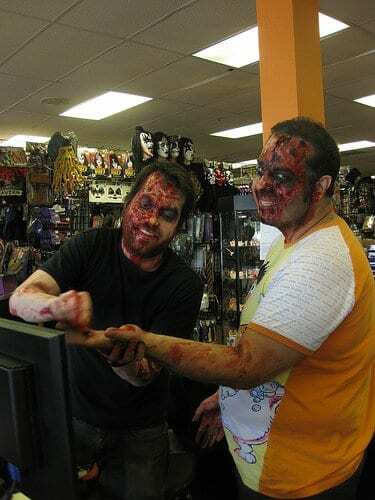 Our friendly and knowledgeable staff are always on hand to lend inspiration or tips to help you look your most rotten and foul! We’ve got loads of fresh stock coming in weekly – blood, fresh scab, 3D gel, rigid collodion, bruise wheels, liquid latex and zombie kits are always a hit with the undead crowd, so be sure to stock up sooner rather than later. We also have a veritable meat-market here with our large selection ofÂ severed heads , dismembered legs, fingers and hands. If you’re in need of costumes or accessories, we have an array of adult, teen and child sizes to help you stand out in the masses of living dead.